Do You Remember... "Man Without a Gunl". Adam MacLean disliked guns and attempted to establish peace through the power of the press. 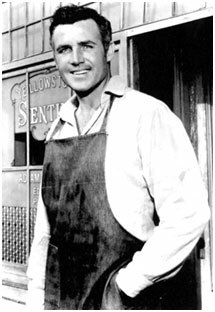 6'2" Rex Reason portrayed MacLean, the hard-hitting owner and editor of the YELLOWSTONE SENTINEL, for 52 episodes of “Man Without a Gun” over two seasons from Nov. 8, 1957, to September 16, 1959. Created by Peter Packer (1906-1981) and produced by Alan A. Armer (1922-2010) and Mel Epstein (1910-1994), the half-hour, black and white series, set in the 1870’s Dakota Territory, was syndicated and bartered to TV stations by 20th Century Fox. Packer also produced five episodes of “My Friend Flicka”, 25 for “Law of the Plainsman” as well as writing scripts for “Bonanza”, “Stoney Burke”, “Virginian” and “Big Valley”. Armer went on to produce “Broken Arrow”, “Untouchables”, “The Fugitive”, “Invaders” and “Lancer”. Epstein began as an assistant director in the ‘30s and also worked on the production of “Broken Arrow”, “Rawhide” and “Medical Center”. “I played a newspaperman who didn’t carry a gun,” Reason explained. “When the heavies would come after my character we’d just end up fighting with our fists.” Basically, Reason is correct, but there were times when he was forced in an episode to pick up a gun taken from an outlaw. But usually the gunplay was left to Marshal Frank Tallman, played by Mort Mills—a great diversion for Mills whose career usually consisted of heavies. Other semi-regulars on “Man Without a Gun” were veterans Harry Harvey Sr. as Mayor George Dixon and Forrest Taylor as Doc Brannon. Good writing and good direction gave the show an above average look, as well as being populated by established western actors—Myron Healey, Jean Willes, Sam Flint, John Doucette, Chris Alcaide, Denver Pyle, Wright King, James Griffith, Fred Graham, Jane Nigh, Francis J. MacDonald, Bob Wilke, James Drury, Trevor Bardette, Steve Terrell, John Anderson, Roy Barcroft, Earle Hodgins, Tommy Cook, Dabbs Greer, Terry Frost, Mike Lane, Eddy Waller, Robert F. Simon, and so many more. 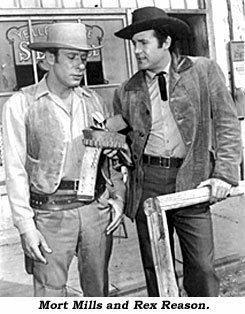 When “Man Without a Gun” ended and Reason had recuperated, he went to work at Warner Bros., guesting on “Sugarfoot”, “Alaskans”, “77 Sunset Strip” and eventually co-starring with Donald May on “The Roaring ‘20s” from ‘60-‘61. Sadly, stern-faced co-star Mort Mills, a veteran of over 150 TV shows and some 50 films from ‘52-‘71, suffered a heart attack at his Ventura, CA, home and died at 74 June 6, 1993. Forrest Taylor, 81, died in ‘65 and Harry Harvey Sr. was 84 when he passed in 1985.